Many homeowners find it difficult to store items in a laundry room due to the limited nature of the space. While organization in all living spaces is important, organization in your laundry room is essential. This is especially true if you want to keep track of how much detergent you have left or if you want to avoid unnecessary clutter on laundry day. 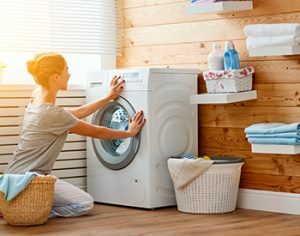 There are simple home storage solutions available for you to utilize to maximize the potential in your laundry room, regardless of what size it may be. From wall storage to storage racks on your laundry room door, the possibilities are endless when it comes to redesigning this important space. These four home storage ideas for your laundry room are projects you can complete over the span of one weekend. You do not need to be privy to home improvement tactics to add these storage solutions to the laundry room in your home, nor do you need a huge budget to redesign your laundry area. One of the quickest and easiest storage solutions for your laundry room is to purchase wall storage to hold your laundry supplies. Items such as detergent, fabric softener and clothespins can be neatly arranged in a wire storage rack to keep all your essential supplies in one designated area. You can purchase more than one if you have an abundance of supplies and arrange them close to the washer and dryer for added convenience. The size of the wall racks you purchase is entirely dependent upon the amount of wall space you have in your laundry room, so you may need to do some measuring before ordering a wire rack online. Not only does installing wall storage help you to stay organized, but it also adds design aesthetic to a room that is commonly forgotten when considering the overall appearance of your home. The nicer your laundry room looks, the more motivated you are going to be to tackle this chore. Another home storage idea you can utilize when redesigning your laundry room is adding a shelving unit to help maximize your space. Oftentimes, laundry rooms are designed to take up the least amount of square footage as possible, which can make it difficult to efficiently operate within this space. By adding freestanding shelving units to your laundry room, you are capitalizing on your available space without breaking the budget. Shelving units come in a variety of sizes, colors and materials and you can choose whichever option best suits your design preference. If you have a free wall in your laundry room, then install a shelving unit to this space to provide you with a designated area to place your laundry once you are done folding it. If you do not like the idea of using wire racks for storage, then you can install a shelving unit to hold your laundry supplies instead without having to worry about drilling holes into the wall to complete this project. If you are looking for a creative storage solution to your limited laundry room space, then installing a bookshelf into the room can help you improve the overall functionality and design. Adding cloth storage containers to the bookshelf not only maximizes your storage, but it additionally allows you to add extra color or pattern to your laundry room. You may need to spend time measuring the square footage of your laundry room and compare this to the size of existing bookshelves to ensure you are selecting the right sized shelf for your space. You can purchase both a new bookshelf and cloth storage containers at most major retail stores for an affordable price. Another way to find affordable bookshelves is to check larger thrift stores containing used furniture. When choosing this storage option, you can buy all the necessary supplies and add this storage feature to your laundry room within the span of one day. You can opt out of the cloth storage containers if you feel as though you are receiving enough storage space by adding the bookshelf on its own. Depending upon the size of the bookshelf and the depth of the shelves, this may be the only solution you need to add to your personal space to gain the storage area you are looking for. For those who have a limited space to work with, there are still storage solutions available to help you declutter your home and laundry room. Mounting a storage rack on the back of your laundry room door can provide you with an easy to install and affordable storage space. All you need to do is purchase an over-the-door shoe storage rack and place your small supplies into the pockets equipped on the rack. If you have more space to play around with or you want a more aesthetic storage option, then you can purchase a metal over-the-door rack in lieu of the typical plastic option used for shoes. You can stack supplies on the storage rack without occupying space in your actual laundry room, as the rack always remains situated on the back of your door. Another home storage solution similar to this idea is to mount hooks on the back of your door and hang decorative bags off the hooks. In choosing this option, you are maximizing your space without having to deal with the added bulk associated with over-the-door storage racks. All you need to do is purchase hooks from a hardware store and choose decorative bags made of fabric to hang from the hooks. You can mount the hooks into the door itself or the door frame, depending upon your preference. Once the hooks are installed you can place all necessary supplies into your fabric bags and hang the bags from the hooks. You can place hangers onto the hooks as well if you are looking for a way to air dry specific items of clothing without leaving them draped around the house to dry throughout the day. You can also opt to use large bags as makeshift hampers, so you can bring the bags down and hang them on the hooks when you load your laundry, then reload the bags and bring your clean clothing back to your room.